Sunday’s the main day for desserts in our house and last week I made these individual tarts. They turned out beautifully and were served with ginger sauce and a ball of vanilla ice-cream – no wonder they were finished off in a flash! They would be nice enough for a dinner party – I think I will make these as part of a “café gourmand” where each guest has 2 or 3 desserts presented on one large plate alongside a small cup of coffee. I could have this tart, some sorbet and perhaps something chocolaty like mousse, need to think about this again! Anyway back to the tarts, they aren’t difficult to make – I followed the recipe and used tinned apricots but I think any soft (or stewed) fruit would be just as good. how to – melt half the butter in a pan and use this to grease 4 moulds – I used ramekins. 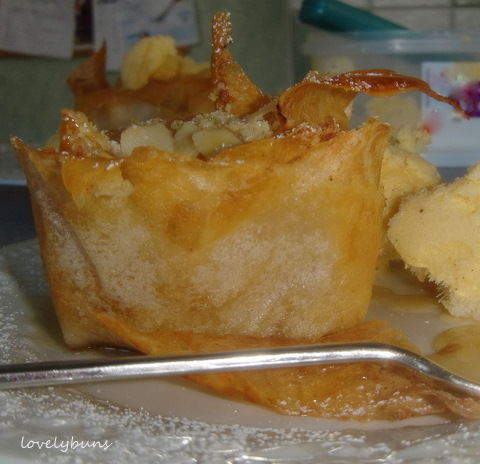 Cut the filo pastry into 8 squares (10cmx10cm) or if like me you have round sheets of filo pastry cut 2 sheets each into 4 pieces giving you triangles with a rounded edge! 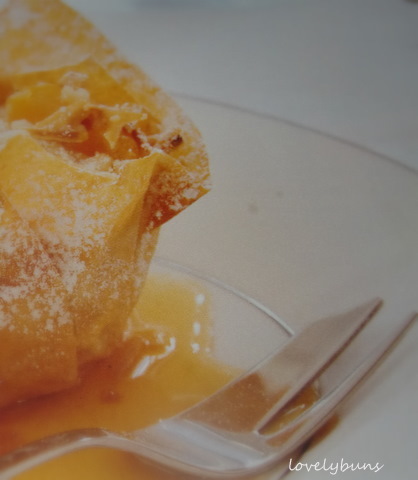 Brush each piece of pastry with the remaining melted butter then place 2 pieces of filo together, one piece on top of the other, twisting the top one slightly so that the edges don’t match up. 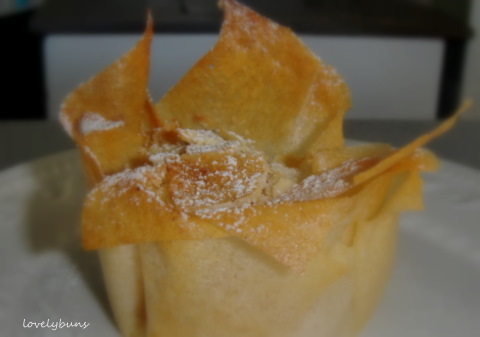 Press the 2 squares of filo firmly down into the base of each ramekins, leaving the edges sticking up over the top. Chill the filo for 30mins before baking at 180°C for about 5 mins until pale golden and crisp. Make the crumble by whizzing together the remaining 25g of butter with the flour, oats and sugar until crumbly. Drain the apricots, keeping the syrup for the sauce, and half or quarter them. 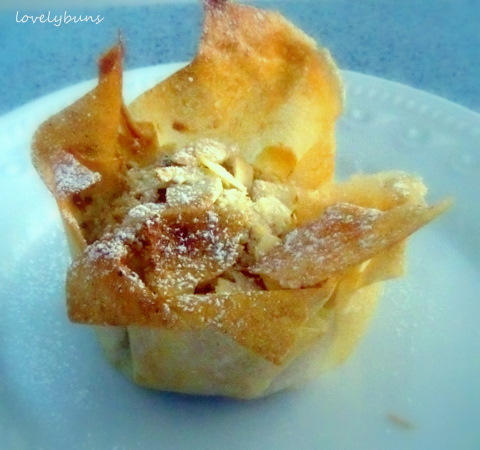 Spoon about a teaspoon full of crumble into the bottom of each filo case then cover with about 3 apricot halves and finally sprinkle the remaining crumble and flaked almonds over the top. Bake the tarts for about 30 mins or until the crumble is golden – I found the filo was browning too quickly so covered them with foil after about 15 mins. Remove from the oven and gingerly (oops!) lift the tarts out of the ramekins. Dust with icing sugar and serve warm with ice-cream and ginger syrup sauce. Ginger syrup sauce – Heat 2 tbsp golden syrup, a squirt of lemon juice, the reserved apricot juice and some chopped crystallised ginger together in a small pan. Bring this to the boil, stirring, then leave to bubble for about 10-15 mins until syrupy. Remove from the heat and pour around or over the tarts just before serving. This could be made a day in advance as the filo cases can be kept in an air-tight tin and the crumble can be kept in a plastic tub in the fridge until needed. I don’t expect any students will be making these, even on a Sunday, but since this blog is also a place for me to gather my recipes I’m posting it anyway! Thanks, they tasted great too. I can deffo see that you are living in France!! Looks very nice!! Thanks for visiting my blog 🙂 It has allowed me to find yours which looks full of lovely sweet things. This looks lovely; I love filo.It is underutilized..
Hi, thanks for commenting and leading me to your blog 🙂 These are lovely and I agree, filo isn’t used enough. This looks absolutely delicious! I’ll have to give it a try! I hope you do, they weren’t difficult and the filo pastry was lovely for a change! What a brilliant idea, looks absolutely delicious!